Excellent, exactly what I needed for favors! I used this product at my sister-on-laws baby shower. Upon arrival I soaked the product in water with detergent for a couple hours, after I rinsed them I let them air dry. I filled up the bottles with rockets and gave them away as prizes. Everyone who received them as a prize thought they were super cute. I put the bottles in party favor bags and they were a hit. I filled these with pre-wrapped candy and gave these as favors for my daughter's baby shower. They were a hit. Used as part of a favor bag for my daughter's baby shower. Filled w jelly bellies in colors that matched decorations and put a little curling ribbon around the neck. The bottles held a generous amount of candy & tucked in bag w other items. Very pleased with overall effect. really loved the size. were bigger than the ones i found at joann's fabric. I added pink, red and white M&M's (in stores from Valentines Day)for a girl baby shower. This is my daughter's first baby and our first grandchild. I also added a label and ribbon. They came out really cute. i used these great size baby bottles for my daughter in laws baby shower and they were just perfect. everyone loved them and asked where i purchased them. These bottles are so cute. We filled them with PINk m&m's as favors for baby shower. Ordered the product for a workplace baby shower. It was loved by all and everyone left the shower with a gift and as I walk around the office I see them on my co-workers desk. These worked perfect for a baby shower I threw! We used them as the party favors. We were doing a yellow and blue color theme for a boy and filled them up with lemon heads. The lemon heads fit perfectly and look too cute! Everyone loved them! 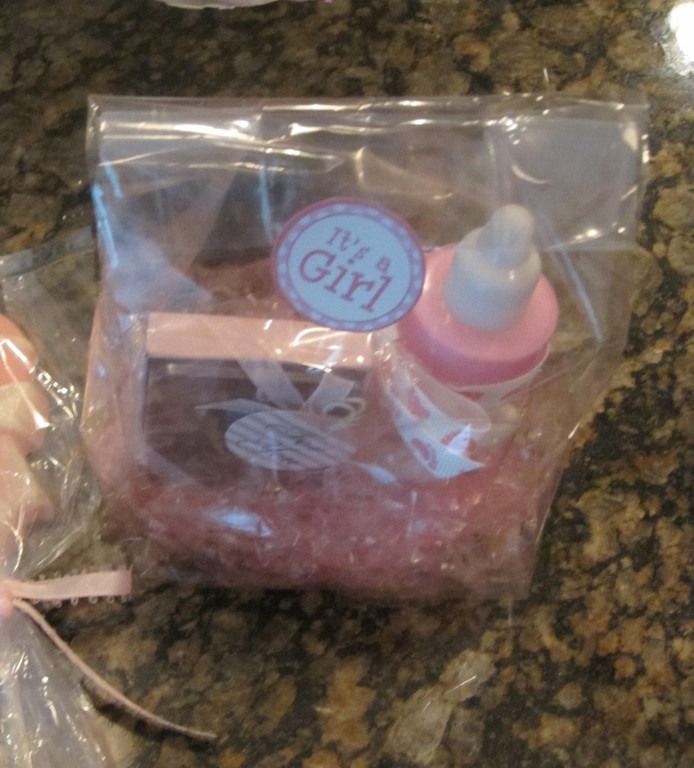 These made adorable party favors -- I filled them with the pacifier candies, attached a ribbon with a picture of mom to be, along with a diaper pin and viola, party favor deluxe! We bought these for baby shower favors and filled them with white chocolate pastel m & m's and they were fantastic! The bottles were bigger than we expected which was a pleasant surprise and they were a hit at the shower! Used these as party favors at daughters baby shower, filled with M& M's and tied a ribbon around each. They were huge hit! Love them. The mini plastic baby bottles are so cute that my guests love them. "A great buy for the money"
I purchased these bottles and they were big enough and held plenty of candy. I was very please with the bottles. Everyone asked where I purchased them. Also, side note purchase the candy here to go with them and mix(getting different candy pastel colors ducks and bottles)that was a real blast for the guest. I purchased the mini plastic bottles for my daughter's Baby Shower, put a personalized label on them and filled them with Salt Water Taffy (a local favorite). Placed the bottles in a basket for guests to grab on their way out. Lots of compliments - they were a hit! Being very affordable certainly helped. Thank you Beau-Coup. I ordered these as a party favor and they are adorable. They were filled with m&ms and nuts and were a big hit. Delivery was fast and I was very pleased with them. These were perfect with skittles, a little ribbon, and thank you note! The guest loved them! I bought these to use as thank you favors for my babyshower. I filled them with different kinds of round small candies: m&ms, skittles, jellybeans. Theyre easy to decorate. Add a bow, notecard or label & you're all set. I had a baby shower for my daughter (my first grandson) and wanted to do something different! I bought these baby bottles and filled them with chocolate candy that were coated blue and white, and used them form my place cards! I tied a white ribbon around them punched a hole in a handmade place card with a lable on it. They looked awesome and everyone liked the candy too! I would so recommend this to everyone! I forgot mention that the quality of this product was great and the price was even better! Perfect for party favors. Filled them with M&M's on the tables for the guests....looked great and made great table decorations. Theses were perfect baby shower favors. I filled them with mini pink and white jelly beans. They were so cute. The baby bottles were perfect! We used them for a recent butterfly themed baby shower. The color is a traditional baby pink. To bring the color to life, we added lavender, hot pink and yellow chocolate m&m's. In addition to butterfly hang tags and ribbon. I would definitely purchase the bottles again in the future! I filled them with pastel colored chocolate covered sunflower seeds from Nut On Line and used them as favors for a baby shower! Used for a baby shower. They arrived quickly and were perfect for a favour. everyone though they were precious! I gave a large office baby shower for a co-worker and made 72 of these with the oval personalized labels, a cute wired bow and filled with pastel M&M's. Too cute! I bought these to use as a Welcome Grandbaby party favor. I filled them with the pastel colored M&Ms and tied a pink ribbon around the rim of the bottle top. Will have them on the tables as favors for our Welcome Granddaughter party,. 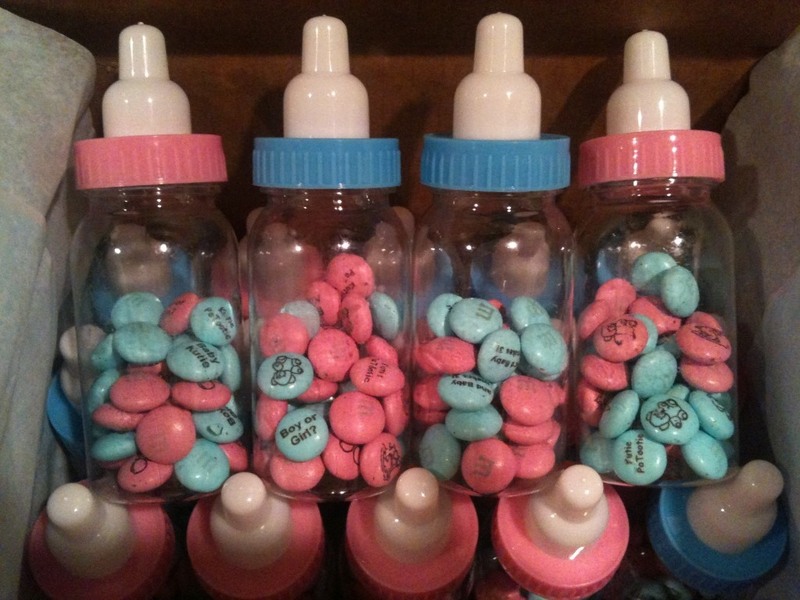 I half filled these bottles with Jordan Almonds pink and white and some with just pink Sixlets for a baby shower. They were so cute. I ordered too many because not alot of people will take a party favor. They were cute and I was pleased. Using for Baby Shower favors for the tables and filling with little candies. After we filled and placed labels with parents name, they were so adorable and will look so cute on the tables!!!! It is a outstanding Baby Shower Favor!!!! Recommend using for either a Boy or Girl!!!!! Wow, what a great baby shower favor! I filled them with colorful Gummy bears!!! Everyone loved them and all of my guests took them home for their childrens baby dolls and play time! So adorable. I filled them with Easter M+M's which are baby colors. Cute favor for our upcoming baby shower! 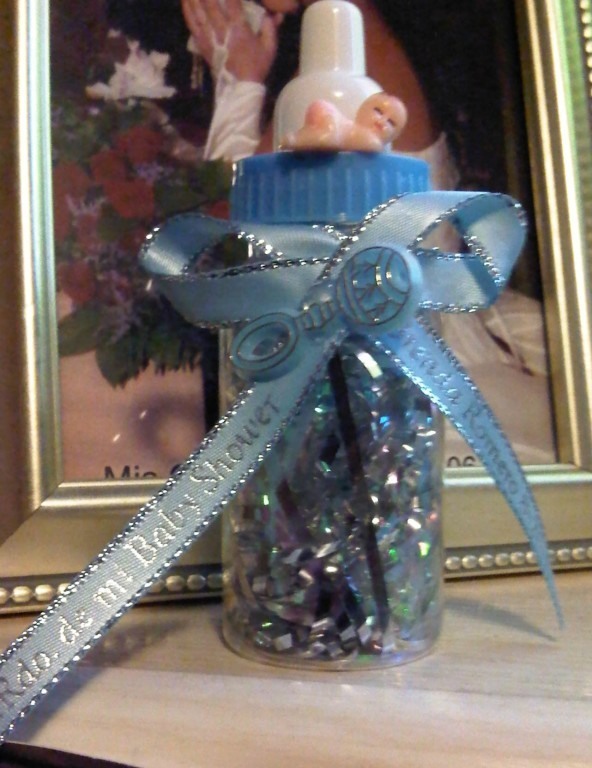 I used the baby bottles for decorations at my daughter's baby shower filling it with candy and tieing a ribbon around it with baby pacifiers thru the ribbon. Filled with M&M type candies and tied with baby feet ribbon. Big hit at baby shower! I got these baby bottles based on the reviews from others who had previously purchased them. I am so glad I did! They are made well and are very, very cute! A perfect shower favor!! This product was great to use. I ordered 30 blue bottles and added silver and white shredded confetti inside them. I attached a baby on the top and added a printed bow with my sisters name and date of her baby shower on the outside. They looked great and the guest loved them. I even was asked to make some for someone else's baby shower. We use these mini plastic baby bottles as favors for our baby shower. Both kids and adults love them. I would recommend them for baby/toddler related parties as favors. These were the cutest addition to the baby shower favors. Last baby shower bought the bottles locally and found beau-coups a much better quality and cheaper than the last ones I purchased. We filled the blue baby bottles with the pacifier candy. We set them all out for favors for the guests at my best friends baby shower for her little boy. Every one loved them, and even better they kept the little ones entertained that joined the shower. I filled them with M&M's and tied a bow around the top and they turned out so cute as favors. This is one of the best baby shower favors that i have purchased. True to size and big enough that i added m&m's, skittles, and resse pieces to them and filled to the top. I loved it and so did everyone else that attended. I was suprised how big the bottles were, perfect i will purchase again if i have to. This was a great product for the dollar. I sued this product as a party favor. Filled the bottle with candies. They were a hit at the shower. I decorated these bottles with a thank you tag made of a small piece of decorative twist paper hole punched at the top and a button threaded thru with embroidery string. So cute! Perfect size candy baby bottles!! I put personlized M&Ms in mine for my daughter's baby shower. They are clean [...] when recieved. I ordered both blue and pink and was pleased with both! 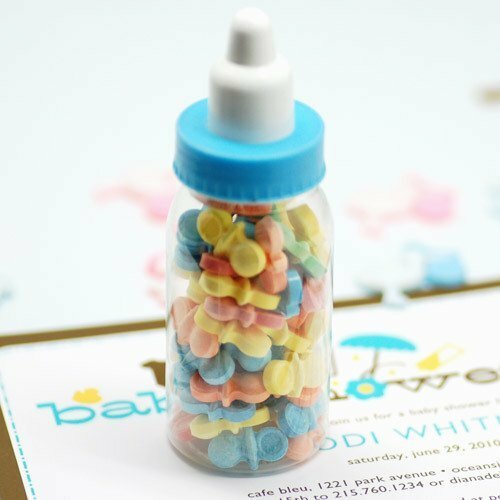 Filled these adoreable bottles with pacifier candy & duck sweet tarts. Tied organza ribbon in pink for "It's a Girl!" around them. Attached a baby carriage seed card thanking everyone for coming. Everyone loved them! Colorful addition to table setting when filled with pastel candies. They are awsome & big. this is the perfect baby shower favor. They are well worth the money spent on them. I put colored sixlets in mine. With ribben. Also I bought address labels and put the thank you right on the bottle. Everyone thought they were the cutest thing. cute, shower guest gifts. Like that I could buy only the pink bottles since we know it is a girl! I ordered personalized m&m's from [...] w/my due date, dad & my name, & It's A Girl! I also tied curling ribbon around neck of bottles w/little thank you tags attached. Q:what's the weight of each bottle and each pacifiers candy bag? A:The pacifiers are sold in 12oz bags, the bottles weights around 2-3 oz. Q:Would liquid be able to be put in these and would it be able to be squeezed a bit to get the liquid out? A:They can be filled with liquid, however, there is no opening for the liquid to be squeezed out. Q:HOW many Hershey's kisses will fit in it? Is the bottle lid easy to open? A:About 10 Hershey Kisses can fit per plastic bottle. The lid is easy to unscrew. Q:What is the best length to cut for personalized ribbon for this plastic bottles? A:This item takes 16 inches of ribbon to tie around the plastic baby bottle, including bow. A:Each bottle can fit between 2-2.5oz of jelly beans, which correlates to about 57 jelly beans per bottle. A:We do not offer this item with labels. Q:Approximately how many mini candy pearls will fit in each bottle? And how many oz are each bottle? Q:What size label is pictured with this baby bottle? A:Approximately 70 pieces of M&M's can fit in one mini baby bottle. 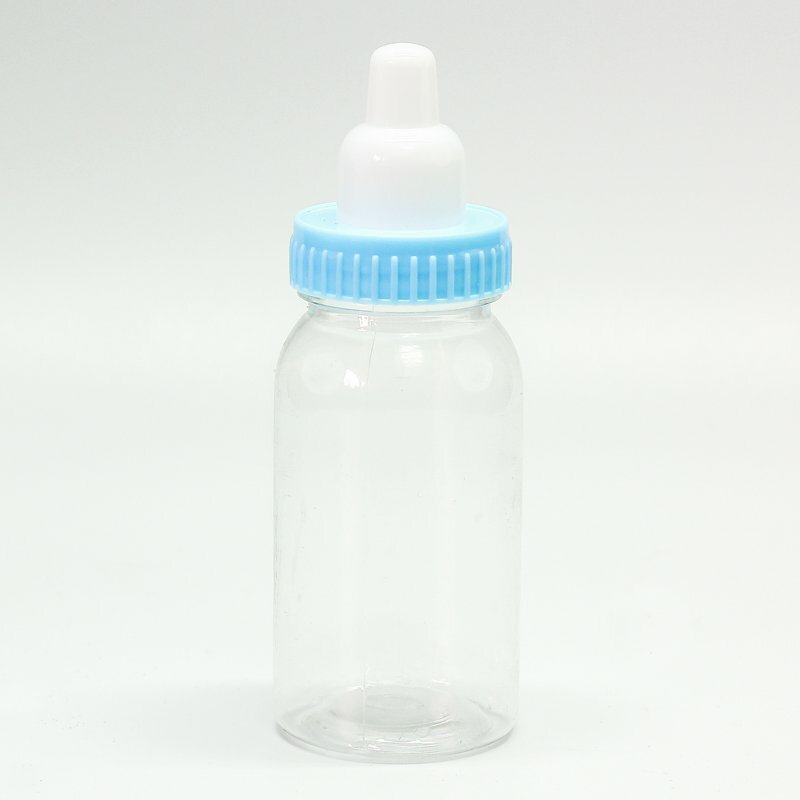 A:1.25" oval labels are shown with the baby bottle. Q:Approximately how many of the pacifier-shaped tarts will be able to fit in each bottle? I am trying to decide on how many bags of tarts I may need to buy? A:Each bottle can hold between 2 and 2.5 ounces per bottle. The bottle can hold 65 pacifier tarts. Looking for easy DIY baby shower favors? Add sweet treats to these mini plastic baby bottles and voila—you have adorable gifts for guests of all ages. 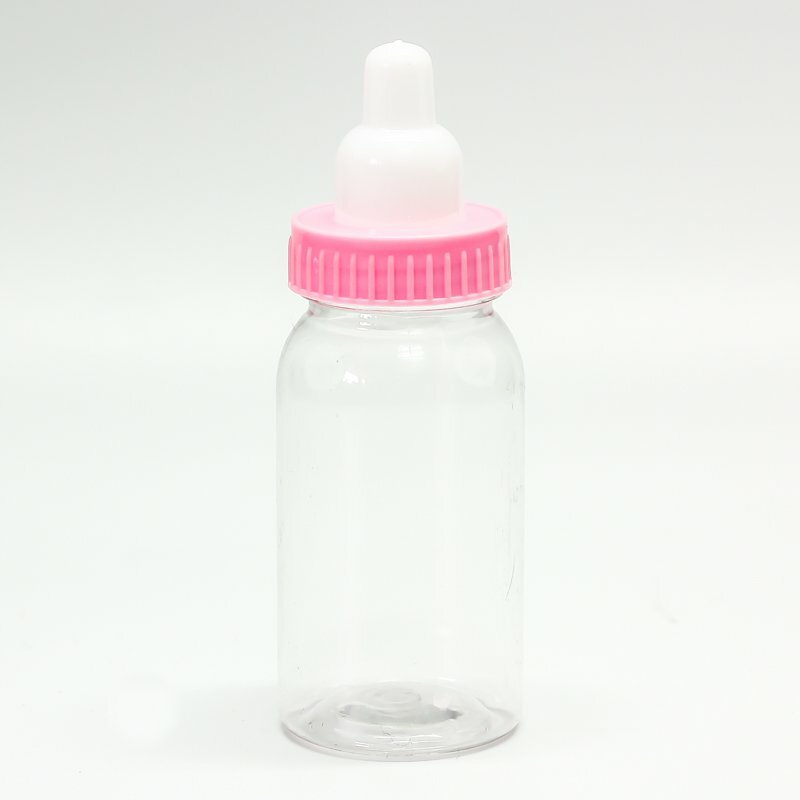 Clear plastic baby bottles feature screw-on tops that are accented with your choice of blue or pink. Fill with pastel pacifier sweet tarts or mini candy pearls (not included). Available in sets of 12. Each measures 4.5"H, 1.5" diameter.